Cold Cream, Lady Lucy Bridgeman 4 ounces of oil of sweet almonds; two Do of Spermacity, about half a cake of Virgins Wort, - put them altogether into a Stew pan, and melt them over the fire slowly, then put it into Spring Water beat it for an hour; then pour that Water from it and put some rose Water to it beat it again till it becomes smooth and soft. Liver Sauce. 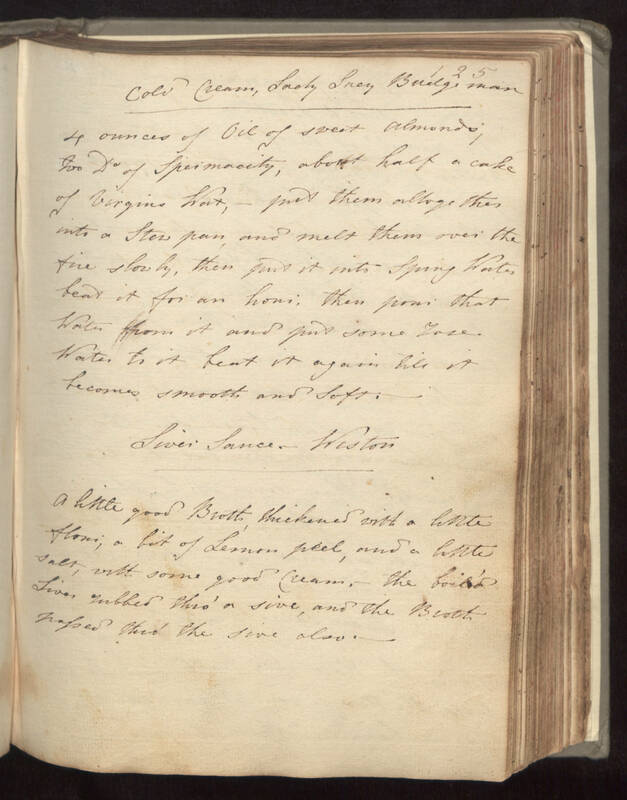 - Weston a litttle good Broth, thickened with a little flour; a bit of Lemon peel, and a little salt, with some good Cream, the boil'd Liver rubbed thro' a sive, and the Broth passed thro' the sive also.